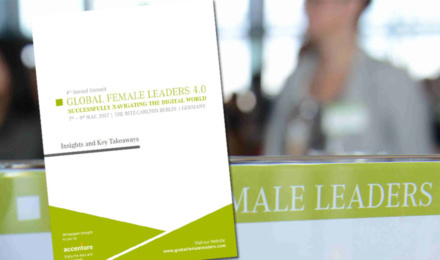 The Global Female Leaders Summit 2017 took place from 7th to 9th May 2017 at The Ritz-Carlton in Berlin. Over 250 top-level executives gathered in the German capital in order to discuss five of the most pressing economic and political challenges humanity faces today. To sum up this great event in a single blogpost would be nearly impossible. The whitepaper addresses five core topics: Economic Challenges, Big Data, AI & Cyber Security, Future of Work, Smart Cities & Mobility and Life Science. Learn how to successfully navigating the digital world! Management Circle AG and their service providers (e.g. Lettershops) use the details obtained during your registration to carry out our services and to send you offers by mail for continuing education, including offers from our partner companies from the Management Circle Group. We also inform our customers by telephone and e-mail of our interesting continuing education offers similar to those you have previously accepted. Naturally, you can object to the use of your data for advertising purposes or withdraw your consent at any time by contacting us at Management Circle AG, Postfach 56 29, 65731 Eschborn, datenschutz@managementcircle.de or by telephone at +49 6196 4722-500.